It’s been a couple years since I first wrote my “What’s in My Bag” post, and since then, I’ve gone through a lot of changes, so I felt it was time for an update. As you may have noticed, for many years, I have carried a very heavy camera gear setup, ranging from 6 pounds at the very lightest to as much as 12 pounds with all the works. I carried all that gear with a pretty minimal pack. As I’d mentioned in 2015, I was evaluating packs to handle the heavier loads that my camera gear often lead to. Above from top to bottom and then left to right. Platypus Collapsible Water Bottles These are my mainstay for backcountry water storage. I tend to bring two 1-liter bottles with me. Generally filling up 1 during the day unless there is a long stretch without water. More or larger bags can be packed when water carrying becomes important (as on desert trips). TP An obvious requirement. My bag is running a bit low in this picture. My TP kit includes toilet paper, extra bags for packing it out, and hand sanitizer. Jetboil Mini Mo With all the stove options out there, the Jetboil is still the most efficient one I’ve encountered, if not the lightest. However, with the Jetboil, I’ve lasted entire summers on a single fuel canister, and I get out a lot. One of these days, I may go in for the lighter version. However, if I’m really trying to go light, I bring my 4–6 oz alcohol stove and pot combination instead. Goal Zero Venture 30, Flip 10, or Flip 20 On longer trips, sometimes some extra power is needed. If that is the case, this is the battery pack I’ll bring. It can be attached to an optional solar panel also made my Goal Zero, but few trips require more power than it already carries. Silnylon zippered bag This is from an old first aid kit that I don’t use, but any small bag will do. This is my backcountry wallet. ID, cards, cords, and other small items go in here. Bear line A simply 50-ft nylon cord with a light carabiner and small tension device are all that are needed to keep your food up and away from critters. iPhone 6 Plus in Waterproof Case (not pictured) My iPhone holds almost unlimited maps, trail guides, flora and fauna guides, and more. When paired with the inReach, it makes a great GPS navigation system. Bang & Olufsen Beoplay H3 Earbuds (not pictured) Sometimes I feel like some tunes in the backcountry. Although mostly these are for calling family on my way home to let them know I’m safe. My clothes are perhaps the most flexible of the gear I bring. The exact combination depends on the time of year, the weather report, and the length of the trip. But this is a pretty good approximation of my standard outfit. Again, top to bottom, then left to right. 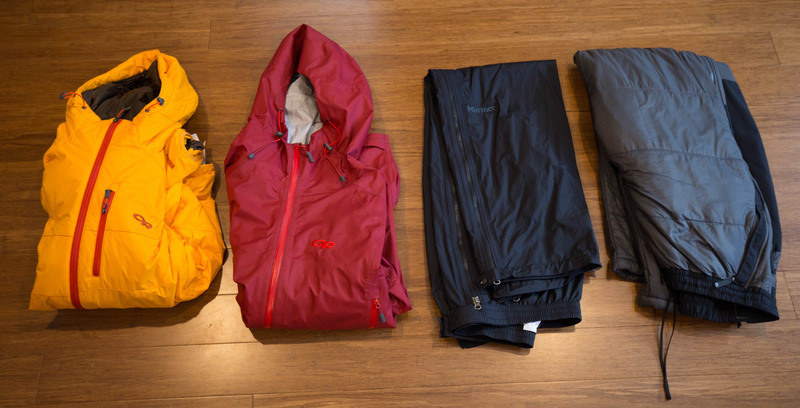 Outdoor Research Halogen Hoodie or Cirque Jacket or Radiant Fleece Shirt This light hoodie has breathable soft-shell along the sides of the body and arms for extra ventilation. It is great as a summit hoodie or warm weather jacket. Outdoor Research Neoplume Jacket or Transcendant Hoodie Without the soft shell sides, this is a much better all around insulator. For colder conditions, this jacket is a must. Sometimes I bring this instead of the Halogen, sometimes in addition to. OR Active Ice For keeping the sun out of the eyes and off of the face. Ex Officio Briefs They are boxers, they are swimming shorts. They keep everything from chaffing too badly. These are my favorite backcountry underwear. Though it would be nice to have something looser for camp. OR PL Sensor, Stormtracker, or Extravert Gloves For warming the handsies. Windproof for good measure. 2 Pairs of Smartwool PhD Hiking Socks The socks last long and remain soft. REI Zip Off Pants or OR Voodoo Pants They are pants, they are shorts. The zip off part zips fully up so that they don’t have to slip over your boots. The softshell material makes them heavier, but more durable and water resistant. In colder weather, I have some additional components that I add to the mix. Outdoor Research Synthetic Puffy or Virtuoso The name of this jacket is escaping me at the moment, but it’s significantly warmer and puffier than two jackets I normally bring. Mountain Hardware Full Zip Puffy Pants or OR Neoplume Pants When the conditions are going to be particularly cold, these pants help keep warm the lower half. Again, the full zip make them easy to get on and off. And finally, the footwear. On the top, my 3-season hiking boots (about 2 lbs together) and my crocs for around camp and river crossings (12 oz). On the bottom, my winter/alpine mountaineering boots. They are much warmer, much more water proof, and much sturdier for kicking steps. Update: I have retired and sold my Osprey. I recently purchased a Gregory Baltoro and have found Gregory to be a much better fit for my body, in particular for the deep curve in my lumbar area. The support on the Baltoro is far more comfortable than my Osprey and I found myself wanting to bring the Osprey out less and less, despite it’s lighter weight. I’ve tried a few of Gregory’s lighter packs, but as of yet have not found one as comfortable as the Baltoro. I am interested in the new Paragon, and may check that out for when I hike with lighter loads. I have 2 versions of the Baltoro. The Bsaltoro 65 is my main pack and is plenty big for most of my needs. I also purchased the Baltoro 85 on a steep discount, in anticipation of the need to pack much heavier for family trips in the future. I’ve already pulled it out once on a hike with Amy’s nephews. I do like the extra two pockets the 85 (and also 75) has, but I generally don’t need such a bulky pack. One bonus feature of the Baltoro is the top lid. The way it is setup, there is a pocket that is perfect for a telephoto lens, eliminating the need for the bulky Mountainsmith chest pack I used to carry. Update: This is where my gear has changed the most. After 20 years as an almost exclusive Canon photographer, I have finally made the leap to mirrorless with the Fujifilm X-T1. This new setup has significantly reduced my weight. Where I once generally carried 10 pounds of camera gear, I now carry around 7, and that includes a tripod. On trips where I think wildlife is likely, the weight savings is a little less (9.5 lbs instead of the 11.5 lbs with my Canon), but it is still significant. And there are other benefits to the X-T1 that make it a super fun camera to shoot with. I’ll go more into my switch to Fuji in another post. My full camera kit weighs a honking 10 pounds. It’s not light, but photography is a passion for me, and so far, the effort is worth the reward. I talk more about how I carry my camera gear in this article. Lowepro Toploader 50 AW They no longer make this chest pack, which is a shame. The new Descent does not easily attach to a backpack like this one does. This pack is great for carrying all the gear here comfortably. Canon Remote Switch RS60 E3 This remote release allows for some advanced photography techniques with slow exposures. It also allows me to release the shutter while the camera is stable without causing any camera shake. Fujifilm XF 55-200mm or 100-400mm Wildlife photography is one of the reasons I bring a camera, so a good telephoto lens is essential. Luckily, I have two to choose from. Update: The 55-200mm can be a bit short for wildlife, though often I find with patience and quiet, wildlife often will get close enough for this lens to do the trick. Graduated ND Filter Graduated ND filters are invaluable at compensating for an overly bright background or overly dark foreground in your landscape shots. When I think there is less of a chance to see wildlife or am trying to go lighter, I do sometimes reduce my gear to a more minimal setup, using a LowePro Toploader instead of my Mountainsmith bag.